JM Associates has used JVC GY-HM850 ProHD camcorders and Zixi encoders to produce live streaming coverage of several fishing tournaments. JM Associates a production company based in Little Rock, AR, provided 18 hours of live coverage of the 2016 GEICO Bassmaster Classic fishing tournament using a GY-HM200 4K camcorder and three JVC GY-HM850 ProHD camcorders in the field and a BR-800 ProHD Broadcaster powered by Zixi in its studio. The three-day event that was held on March 4 in Tulsa, Okla., and attracted more than 100,000 fans. JM Associates also produced five hours of edited coverage for ESPN2 after the event, as well as live coverage for the website www.bassmaster.com. Like any production company covering outdoor events, the producers of the Bassmasters Classic faced a host of logistical and operational challenges in capturing the action of the tournament for their audience of dedicated fans. Unlike most live broadcast sporting events, the action of the Bassmasters tournament isn’t confined to a single, easily managed field of play but rather features competition spread across lakes and rivers stretching upwards of 150 miles in length. And when the field of competitors is 65 fishermen equipped with boats capable of reaching speeds over 80 MPH, keeping track of the action as it unfolds in real time becomes next to impossible. This logistical hurdle forced the shot producers to tape, edit and distribute the competitions in a lengthy and fragmented production process that would ultimately air months after winners had been crowned. With the introduction of remote live production over IP, that problem now could be solved. This year, JM Associates, the live event television production company that spearheads the delivery of the programming, began using technology from Zixi, a software platform that provides network-aware video transmission, processing and multi-point distribution over the Internet. This technology changed everything. The competitions are now produced live with Zixi-enabled JVC cameras and Zixi-enabled Teradek Cubes streaming over 4G LTE right off the water. The cellular signals are received in a JM Associates production truck, located at the studios in Little Rock, AR. The studio talent provides audio color while a producer cuts live to anglers out on the water. The event is then streamed to viewers over Bassmaster.com, which is hosted on BrightCove, an online video platform. 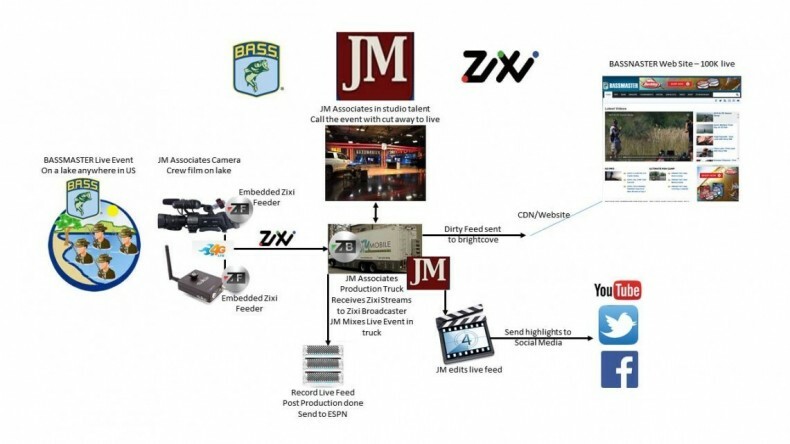 Signal flow block diagram of video path JM Associates used to produce live coverage of a BASSMASTERS fishing tournament. Howard Downs, engineer in charge for JM Associates, said the typical setup includes four JVC camcorders, plus two Sony camcorders all paired with Teradek encoders. The JVC camcorders are equipped with 4G modems that plug in directly via the camera’s USB port. The camera feeds go to a JVC ProHD Broadcaster in Little Rock, then to six Teradek decoders on the truck. Total program delay is about one-second. The only transmission restriction has been 4G network availability. While that technology continues to expand, it remains scarce in some rural areas. Downs said at least three cameras are usually transmitting at any given time. 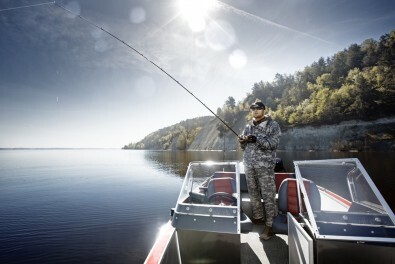 The production cuts to coverage of a different angler if there is no signal available, but when necessary, the JVC cameras can automatically reduce picture quality to compensate for a weak signal. “If cell service is good, the pictures are beautiful,” said Mike McKinnis, VP of media content at BASS-JM Associates. For audio, a featured angler wears a wireless lavalier microphone. The same camera operator remains with an angler to provide live coverage throughout the day. Instead of an IFB system, all camera operators wear an earpiece and use cell phones to join a conference call with the director. While the feed of every camera is recorded in the production truck, simultaneously each camera records footage internally on SD cards to provide the best image quality for post. The live coverage from the JVC cameras has also allowed JM Associates to change its workflow. In the past, the company would take its entire production team to an event, including talent, and produce the entire show on site. Now, the talent remains in the company’s studio in Little Rock. The 4G LTE cellular links combined with streaming cameras and IP encoding enable live coverage to be provided from locations that previously would have been inaccessible. JM Associates now produces the Bassmaster series of events live for the entire season. In addition, the production company uses clips from the live content to create highlights on the fly and publish them to social media. The Zixi-enabled JVC cameras and Zixi-enabled Teradek Cubes combine to feed live programming over IP to the production truck. There the show is mixed, including in studio coverage, talk back to the talent out on the lake, and the resulting dirty feed goes to BrightCove where it is seen by over 100,000 people.